Were I to do being and time again, I think I'd skip it and read this instead. About as long and 86% clearer. 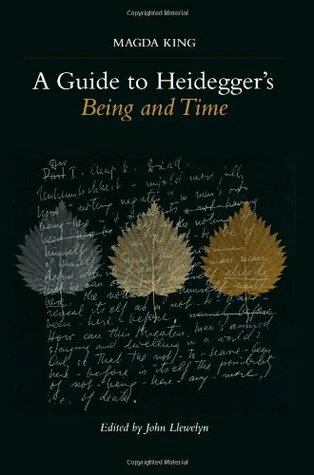 A classic (written around 1962) on Heidegger's Being and Time. It helps break down his work very well and illuminates certain aspects of the text that would go unnoticed by most of us (since we all, obviously, don't hold PhDs in ontology or phenomenology). It helped me very much when reading it along with the text itself. However I'm still slightly confused as why the editor of the book decided to use the Joan Stambaugh translation (which is much easier to read) rather than the more standard (and more well known) John Macquarrie and Edward Robinson translation. Fabulously helpful to me. I have some background in philosophy, so I can't say how others would respond but this careful, step-by-step approach came at the right time for my gaining a better grasp of Heidegger and streams of thinking coming after him. I love this book. It helps me review the material and try and reconstruct arguments, look at them in new ways, and listen to an academic opinion and even disagree with it to help cement my own. I bought it to augment my copy of Being in Time (Stambaugh). An indispensable eye-opener to read along with Heidegger's historic book. I did have to read it for a university course in Phenomenology, but after some mental adjustments this read as easily as a very good novel. Heartbreakingly important. I am not sure of this book's position in the pantheon of Being and Time commentaries, but it is certainly way too turgid to recommend.